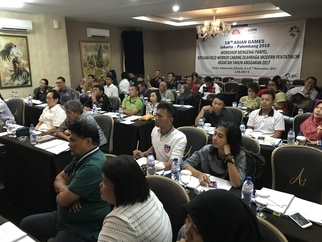 Modern Pentathlon Indonesia hosted its first course under the Judges Certification Programme (JCP) in the capital city of Jakarta as the country’s technical officials continued preparations for the 2018 Asian Games. The JCP has been introduced to help provide well-trained and competent officials who will uphold sporting standards and help to enhance competition standards in Modern Pentathlon and all UIPM Sports. The programme divides judges into three certification groups - Level 1 (Assistant Judge), Level 2 (Judge) and Level 3 (International Judge) and the UIPM certified 51 Judges at all three levels who are now qualified to work in all disciplines of Modern Pentathlon. For the first time in Jakarta (INA), where the Asian Games will take place in September 2018 with Modern Pentathlon on the programme, judges at Levels 2 and 3 attended an e-learning course in the new educational platform as part of their preparation for the 40-hour onsite course. The JCP promotes a professional approach for recruiting, training, retaining, recognizing and rewarding technical officials. It gives a framework for judges’ education as part of a solid system with a clear pathway to develop competency according to international standards and promote progress on merit. In addition, the inclusion of e-learning brings a new aspect to UIPM’s educational portfolio.